The world never stops running. Do you? Update 2013: My SSD died and I replaced it with CF card. For more info check out my blog post. Last weekend I had to work all day on my Acer Aspire One AOA110. That's roughly 12 hours of painful waiting for the slow SSD to finish the simple tasks I was doing! At some point that day I started searching on the internet for a solution to this agony and found a firmware update to my Samsung P-SSD1800 8GB SSD. The update is for 8 and 16 GB variants, so AOA150 can flash it too. I did not rush into doing it because I knew I'd lose all of my info (not that you could store a lot on 8GB :D). It wasn't till today that I flashed it and I'm impressed by the results! As you can see, burst rate is doubled, access time is nearly twice faster and the drive now keeps much stable read speed! Write speeds are not tested, as that would have destroyed all my info, but I bet they are better, too. Note before the update the drive was called P-SSD1800, where after the update it's PATA SSD - that's normal. My original FW version was ver2.Y0C. The new one is ver2.M0J. So, if for some reason you already have this version, there is no need to flash it. Ok, let's get to the flashing part! 2. HP USB Disk Storage Format Tool, Rufus or other utility that can make your flash drive DOS bootable. 3. AOA110SSDFWv1.rar, containing needed files to create DOS boot disk with HP USB tool, and the firmware itself. 1. Backup things from your SSD and flash drive as both will be erased during this operation! 2. Insert the flash drive into one of your USB ports and run the utility from 2. above. 4. After the disk is created, copy all the contents of AOA110SSDFWv1.rar to it, ignoring conflicts. 5. Reboot and boot from USB flash drive. 9. Another dialog (and the last of that type) shows with options (0) 8GB SSD and (1) 16GB SSD - choose the one right for your SSD. In my case this is 0, as I have 8GB version. 10. After that, the main window of the flasher program will be loaded. You need to press Enter once to start the process of updating. Some lines will start showing in the right side of the window and when all is done, you'll get big green PASS in the bottom left corner of your screen. 11. After that press X on your keyboard to exit the program. 12. Reboot PC and install your OS of choice. how long does it take to flash the ssd? Can't thank you enough for this. 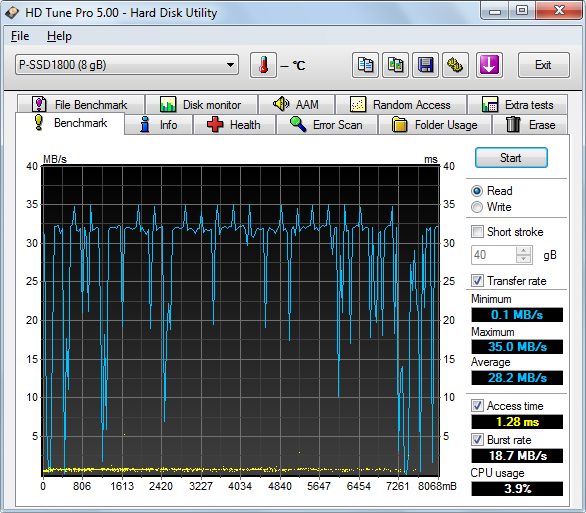 My aspire one 8G SSD has been broken for about a year so I've been running it off a usb stick. Used the firmware upgrade and it's fixed. It hung first time, so I ran and selected force erase all block and it rebuilt the drive. I'm now running XP on it. Updated with screenshots from 16GB model. The SSD in my AAO looks to be dead and I am looking to find a replacement, but now I think I will try to update the firmware! I have been using Micro XP 0.82 and Enhanced Write Filter (EWF) overlay, and it totally rocks! This setup is seriously the fastest computer I have ever tried, it boots in less than half a minute (and that's after installing lots of stuff, on clean install it's about 20 sec!). If you don't like MicroXP (it is lacking some stuff, but you can install it afterwards), try just EWF I promise it is still like day and night! EWF is a write overlay that caches all writes to the disk. it's a part of embedded XP (XPe), but can be extracted from the latest service pack for XPe and installed on any running Windows XP installation (and disabled or removed again). This looks so cool, I'm going to try it now on my ZG5 Netbook which has an 8GB Drive that is starting to fail. What is the best option to choose to try and revive the drive? I just want the software to find the bad sectors and not use them anymore. I have 1st generation aoa-110 with 8gb samasung ssd and I am getting this error: [ERR_801]Flash ID does not match ini. Tried multiple reboots and can't get pass this error. Any help please? Are you sure you are with Samsung SSD? I remember first generation AOA110 were with 8GB SSD manufactured by Intel, not Samsung. I think you are right. Under product info, it says Samsung, but when I let program detect card, it says Intel/Micron. 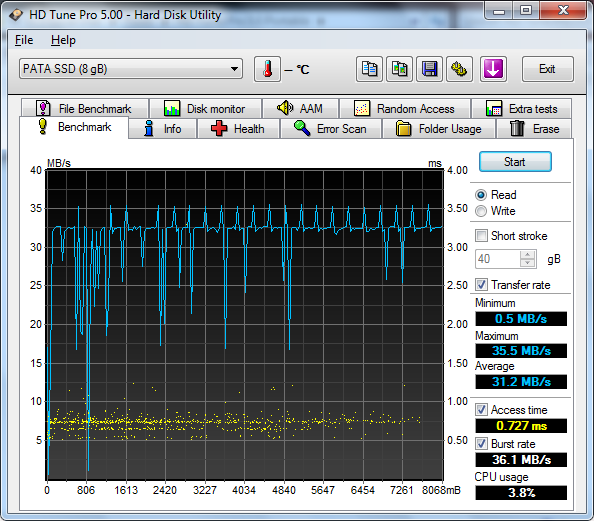 So, what happens to my ssd now? Is it done for good? It's not showing in BIOS anymore. I know this has been posted in 2012, but to fix your Intel ssd download this file: http://metal03326.blogspot.ca/2012/04/samsung-p-ssd1800-firmware-update.html (Right click - save as) and copy the file to the SSD\flash\(GIG SIZE) folder (Eg. H:\SSD\flash\8G). I fixed my ssd using this method! I have questions. What about card life, or data functionality? Is this firmware safe? Thanks Bro, I flashed my 8Gb SSD, it said PASS. Now it says PATA. One Question will Windows 8 fit on 8gb? Also a note about Flashfire, It corrupts your windows system files, i learnt this the hard way, last week 5000miles from home in a seminar, it Died! Yes, Windows 8 will fit on 8GB but you won't be able to use it for long, as Windows tends to eat space with time and in a couple of days you'll run out of space when installed on 8GB SSD. If you make lite version of Windows 8, then you'll have some more free space, but still - you'll run out again. You can also use NTFS compression to make the files smaller, thus freeing some more space, but you'll notice a performance hit. I was having problems with my AAO 150.It wasnt detecting the SSD drive so i tried flashing it and lo and behold it started working again so thats another fix for all the AAO users out there and it really works faster now maybe even double the speed before flashing.Thank you and all the best to you. This worked great, thanks! I have an AOA110 with the 8Gb Samsung drive and Ubuntu installed. Over several months the machine was getting slower and slower, with the hard drive light coming on for extend periods all the time. Eventually, there were constant freezes of a few seconds with the hard drive light on, and the machine was pretty much unusable. I ran the utility and the machine is working like new again! Thank you . After this up-date my Lasarus(AOA110 16Gb) is Aliiiveee. I suggest Win7 superlite v2.0. Hi i have a question. Is it possible to wirte firmawe to this disk P-SSD1800 16gb in other notebook/laptop ? Or some method from usb to sata/ata cable ? I have few disks, but I don't have this acer laptop. I have converter from zif to 2,5 ata and then connected to "ata to usb" cable. So it is possible to write new firmware externally ?